I just have to chime in here and say I love the interior you made for my car. It is just amazing!! Better then OEM!! I have a hard time believing Amida is a person. I have never seen a photo of him. He never makes mistakes. All his work is flawless and amazing. 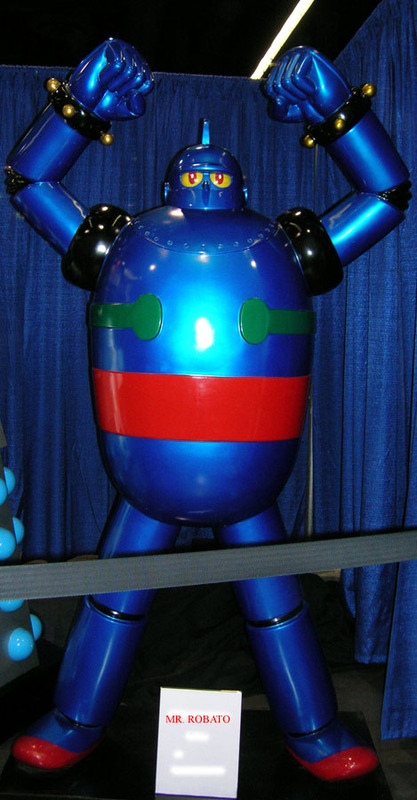 I am convinced he is a robot. Hey, Rob I sent you a PM with a question. Do I see a bigger workspace in the future? It would be nice to have more space, but more space means more overhead so it looks like working in the garden will have to do for now. LOLz!! Blue is a good color for you. What is the 2nd one from the right covered in? Headliner material used on prototype. Too thin for my liking. Thanks. Maybe someday I'll open a small shop in the industrial Georgetown/Southpark area, cheapest place in Seattle. A cool place where a few chopper builders are located. Amida is really the Stig. 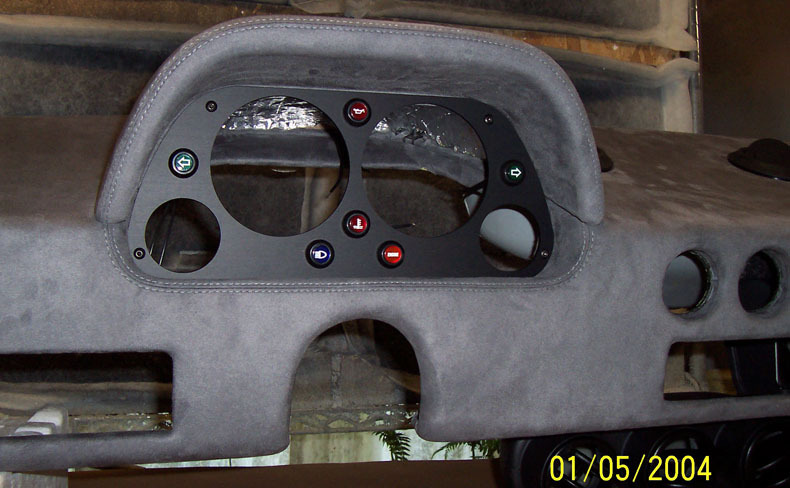 Do you have or can you build a center glove box replacement to accomodate a 10" subwoofer? I have not done a speaker enclosure. That's probably something that should be made of MDF for better acoustical properties. 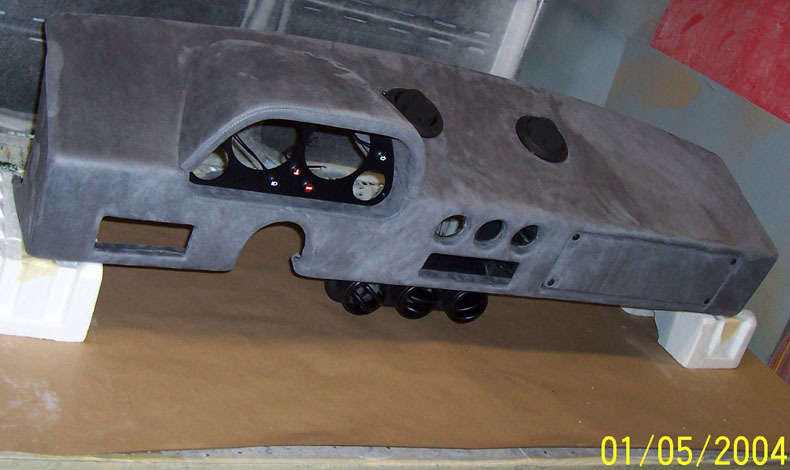 Fi40 dash nearly completed being test fitted before shipping to California. Fits the stock Fiero cabin perfectly. Moving the Fi355 chin spoiler up to the project table. It appears that this Imola piece is higher at the front that it is at the rear. Hmmmm...I wonder if it has anything to do with getting in & out of driveways? If I made it more parallel to the ground then it would be about 3/4" lower at the front. Chin spoiler added to the latest rendition of the stretched Formula. I like the idea of tapering it. Gives it a more slick appearance, like the car is in motion even when it is not. Plus the extra clearence wouldn't hurt either, I've already drug mine over my driveway. You mean raise the front of the chin for ground clearance? I was doing some measuring today for my future nose piece that I am going to order from you Rob, when it finally dawned on me why the genuine 355 nose looks so much shorter from the leading edge of the hood to the belt line of the side molding, then any and all Fiero 355 noses (yours is still by far the best IMHO). 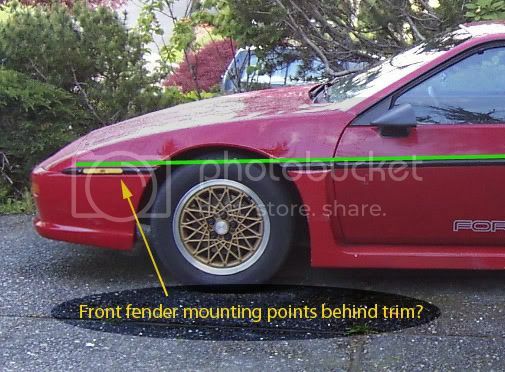 The belt line of the 355 is level (for the most part a straight line as in the rendering you did on your concept above) where the Fiero arches with the front considerably lower than the rear, breaking at the trailing edge of the front fender and about 1" lower on the belt line in front of the front wheel well. I don't know if that made sense but here are some reference points and an example of leveling the belt line (trim) with the door belt line (trim). I rather doubt it would be worth the effort to make a new fender as you would have to make new mounting points for the front as well I would think. (marked in yellow). Are you going to reposition the trim on your concept as well as you did in the drawing? I for one might go to the effort of repositioning the trim thus raising but chin spoiler and ground clearance? I'm not sure why the Fiero designer drooped the front of the belt line like that. I think it's actually arched all the way from rear to front. I think it would have been better to keep it a straight belt & just point it at a slightly lower angle. Nevertheless, I have no plans on trying to straighten that out. Yes, the F355 belt line is straight. Kinda. If you look at the Imola chin it is narrow at the front and widens as it flows back towards the wheel well. 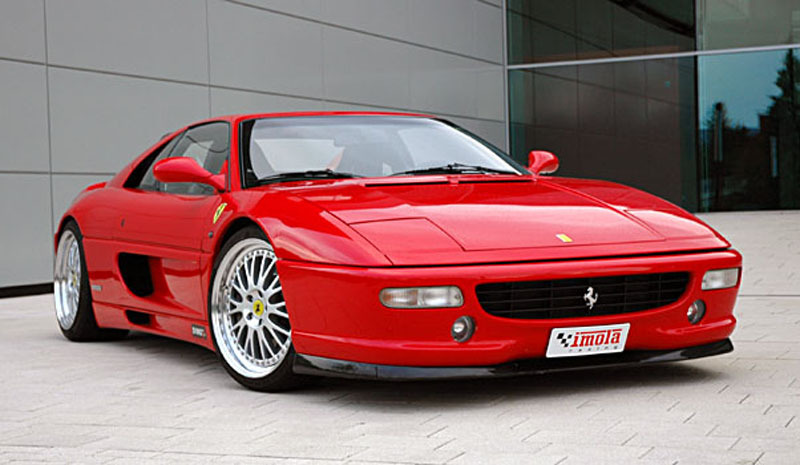 It may not be possible on the Fi355 front because the bottom angle of the fascia is not the same as the Ferrari's. I would have to do some photoshops. The look hinges on how well it will flow with the side rockers. 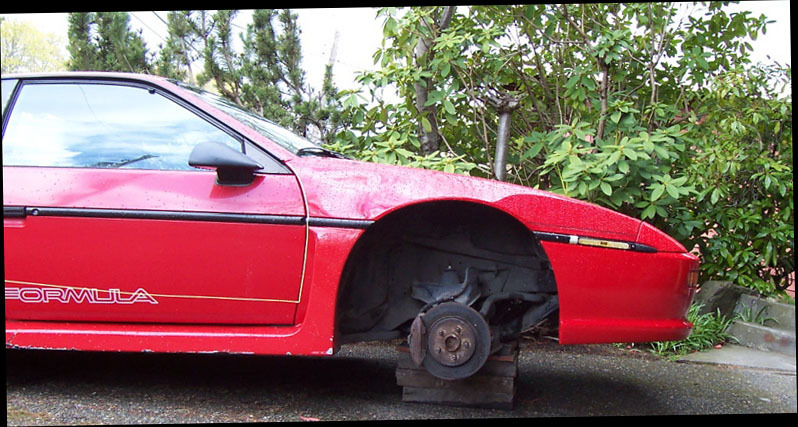 Rob, your car has the Archie rockers that appear to look lower then the stock Fiero units. On another note though, I am really excited to see this project starting. Can't wait! Can someone with GT rockers take a straight edge to the front of the wheel well & give me a measurement between the rocker line & the GT fascia? My guess it's between 1" - 1 3/8" . I made the rear corner of the Fi355 nose the exact same height at the GT aero fascia, but I think my rockers are lower than stock. Thanks. Here is a comparison with the Fi355 front and stock rockers. My car is in for paint so I can't give you a measurement. i measured my stock 87gt on a flat surface (garage floor) floor to bottom of gt rocker is 6 1/2 inches at rear of front wheel 7 1/2 inches at facie in front of the front wheel. leaving the nose facia 1 inch higher than the rocker.. hope this is what you were looking for.if not just let me know and i'll do it. ps: if this is for the chin spoiler, keep in mind that some of your customers ( read I ) will be using rockers from the wide body kit. Funny you should be looking at this now. Last week I was looking at the exact same thing. I decided to leave it, for now. The belt line is one of the features that makes the Fiero a Fiero...so I think I'll just keep them on my stretch widebody. ...so I think I'll just keep them on my stretch widebody. So, when are you going to start that project, Rob??? I'm clearing a garage bay currently to get the Formula in for clutch & waterpump repair. Once in the pit I'll be able to start tinkering with the body bit by bit. 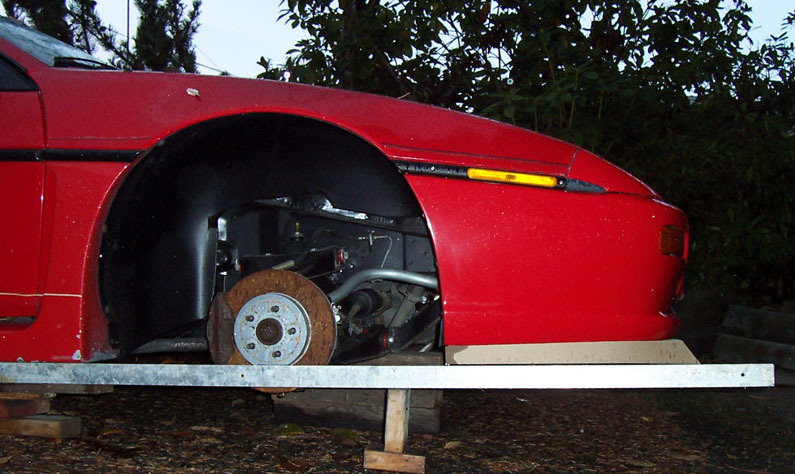 I think 1 inch should be fine at the wheelwell and a 1-2 degree slope towards the front. I've seen some chin spoilers on various cars that appear to be lower than the side rockers which sort of takes on a snow plow look, and I'd like to avoid that. 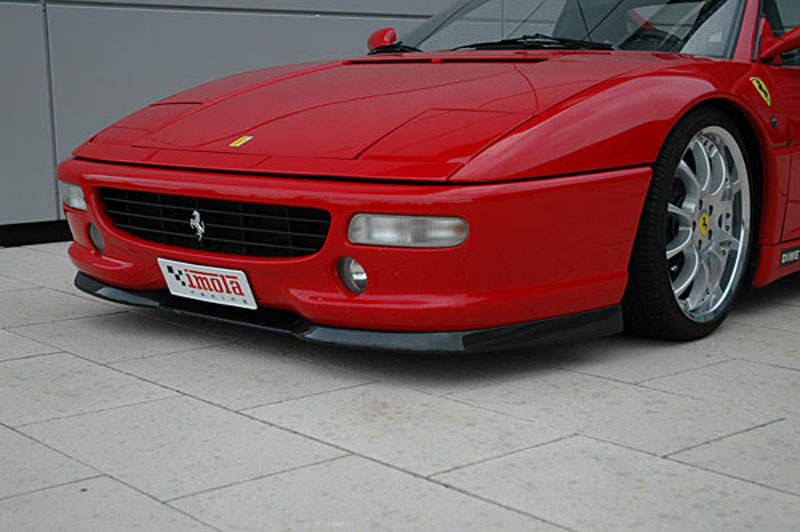 I have the Fi512 nose next in line, after the Fi355 chin spoiler. I'll start thinking about the GTP a little later. One thing that I think I'll change from now on is to eliminate the two piece nose design and just do a one piece unit. Although I personally like the two piece design better, this will save on time & cost and more Fiero buffs can enjoy my creations. wwould you be willing to sell just one of those top pieces? Only as part of the Fi355 nose for the time being. 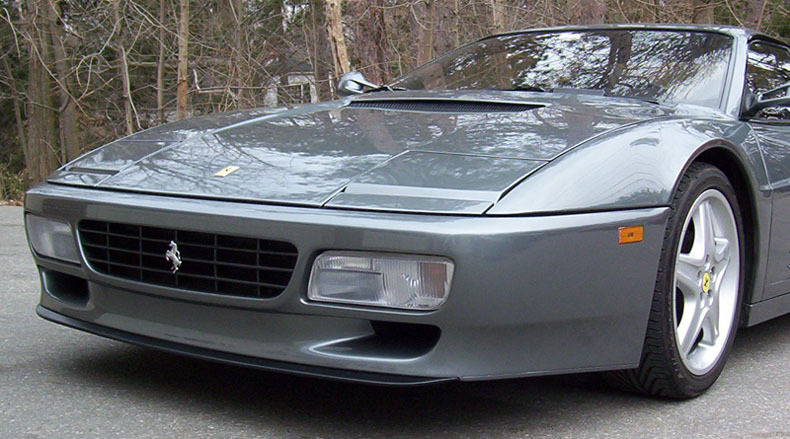 The 512tr nose should look pretty nice on the front of the Fiero, but I'm starting to have doubts about making the investiment in time & $$$$ given how slow things have gotten on this forum. A little voice in my head is telling me to move away from the limited Fiero & kitcar niches & focus more on larger more active markets. Amida, you need to do what is best for your family. I am sure that you will always support our obsession. From the comments left in this forum about your work, I am sure that your creations will prosper no matter where they are applied. I say, go out and keep making a name for yourself. The latest Fi40 dash just completed. Granite 'ultra' suede. This one with the pod upholstered. It would be nice to see eventually how these dashes look installed in the owners project cars.